I am a bit slow getting around this morning so I thought I’d share one more painting from the Principle Gallery show. This is titled The Navigator and is 24″ by 24″ on canvas. Accompanying it are the words from the 17th century Dutch scientist Christiaan Huygens. Shortly before his death in 1695, he had written a book, Cosmotheoros, in which he postulated on the existence of extraterrestrial life in the far reaches of the universe. His lifelong study of the cosmos allowed him to see how tiny and possibly inconsequential our world was in relative terms. 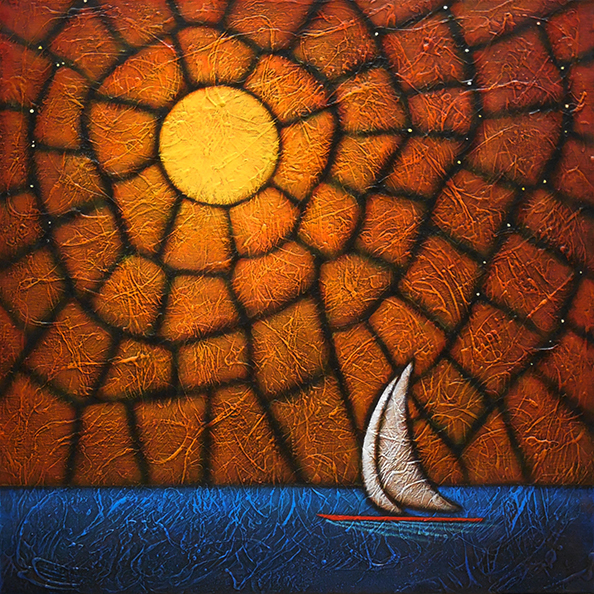 And that is a fitting thought for this painting as the boat skims over a vast sea, guided by the light from huge suns that are so distant that they may not even exist at this moment even though their light still travels to us through the dark of space. The universe is humbling in its scale and scope. I’m still so taken with these “new” skies. The stars twinkling in those interstices are wonderful — they add a different kind of depth to the paintings. I suspect Huygens would have liked these paintings, too.